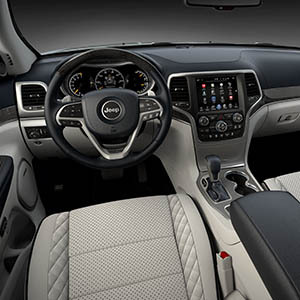 The new available, Grand Cherokee interior is topped with a soft suede-like headliner for a deluxe finish. Quilted bolsters with contrast piping highlight the soft, supple optional Laguna leather-trimmed interior. Gloss, real wood accents add warmth and style to the sumptuous and inviting interior. 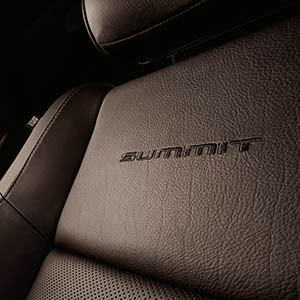 Adding to the luxury and comfort are heated and ventilated front seats and heated rear seats. Grand Cherokee now comes with a new configurable 17.8-cm (7-inch) multiview display with leading-edge Thin Film Transistor (TFT) technology that lets you tailor all your personal settings and graphics. Detailed information on your vehicle is integrated into the advanced color-coordinated cluster, so you’ll be able to view the speedometer, the navigation screen, the settings on the Selec-Terrain® system, Quadra-Lift® suspension system information and more. With an available CommandView® Sunroof, you’ll enjoy a dual-paned, sliding-glass ceiling with power controls. The sunroof opens to reveal new vistas and includes a power sunshade to help keep you cool. A single-pane power sunroof is also available.